The San Francisco 49ers lost the battle of the legs on Saturday night, as a late touchdown secured a 19-12 victory for the Denver Broncos at Mile High Stadium. With both team’s offenses sputtering and stalling, Saturday night’s contest saw seven total field goals through 46 minutes of play before Denver broke the monotony with the game’s first touchdown just outside of the two-minute warning for the go-ahead score. Starting quarterbacks Colin Kaepernick and Peyton Manning were kept scoreless throughout their two quarters of play, as the Broncos fierce pass rush and the 49ers solid cornerbacks core stalled their opponents drives short of the goal line. In their first challenge against one of the NFL’s elite defenses, the 49ers first team-offense failed to move the ball through the air during the first two quarters, as the Bronco’s tenacious pass rushed overwhelmed a weak and porous offensive line. Led by the formidable outside linebacker duo of Von Miller and DeMarcus Ware, the Denver Broncos hassled quarterback Colin Kaepernick as he attempted to buy time in the pocket to the tune of two sacks, including one for a safety, while disallowing the 49ers to gain any positive yardage throughout two quarters of play. The troubled right side of the line was the culprit responsible for both breaks in coverage for Kaepernick, as TE Garrett Celek and RT Erik Pears were overmatched by the Broncos pass rushers. The 49ers had more success with sticking to last week’s formula of moving the ball on the ground. The 49ers run game welcomed a pair of fresh faces to the field as Kendall Hunter and Reggie Bush made their preseason debuts. Bush in particular had a rude welcoming at the hands of Denver’s Aqib Talib as the veteran running back leaped straight into the defender’s arms, only to be slammed down roughly on the sidelines. 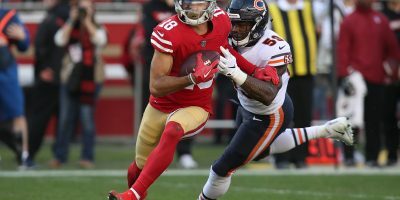 However, the run salvaged what was an aborted snap to the tune of 21 positive yards, and showed Bush’s speed is still a dangerous weapon for the 49ers. Bush also replaced sensation Jarryd Hayne in the return game, although the veteran running back fared worse than the Australian rookie, returning one punt for four yards, while allowing another punt to bounce to the 49ers own five-yard line. The 49ers would not mount a threatening drive until late in the second quarter, when Kaepernick hurt the Denver defense with his legs instead of his arm. The athletic Kaepernick scrambled his way to 53-yards rushing after being flushed out of the pocket twice. Kaepernick also picked up his first pairs of receptions on the drive, connecting with WR Quinton Patton and Torrey Smith, his first reception of the preseason, to gain 13-yards. The pickups would bring the 49ers flush to zero yards passing after the pair of sacks kept them in the negative for most of the first half. 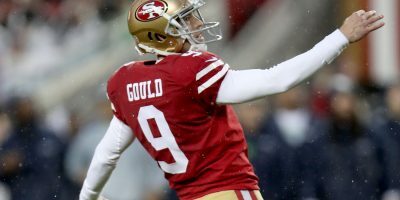 The drive would stall short of the goal line,however, forcing a 41-yard field goal from veteran kicker Phil Dawson to put the 49ers on the board for the first time all game, trailing by a score of 8-3. 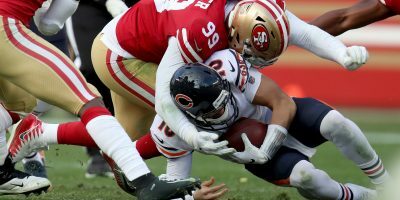 The final numbers for the 49ers first-team offense were a grim reminder of the weaknesses of the offensive line’s protection. They amassed 113-total yards, all gained through rushing, while possessing the ball for just 8:30 minutes the entire first half of play. The stat-line is a grim reminder that the 49ers may be forced into running a one-trick pony type offense this season, as they may rely solely on rushing for positive yardage if the line continues to be incapable of providing Kaepernick enough time to find his receivers. 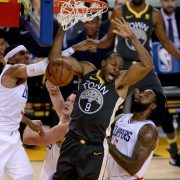 In typical fashion, it was the 49ers defense who kept the lackluster offense in the game on Saturday night, led by All-Pro linebacker NaVorro Bowman, who terrorized the Broncos offense throughout his time on the field. Bowman plugged up the Broncos rushing lanes, laying various big hits throughout the night on opposing running backs while being a defensive anchor across the middle of the field. Bowman also flashed his speed and agility in his surgically repaired knee while dropping quarterback Peyton Manning twice for two sacks. Bowman, who played just three snaps in last week’s contest, made the most of his extended playing time, tallying nine tackles, two for loss, and two sacks in Saturday’s matchup. Surrendering just six points, the 49ers defense remained resolute against the high-powered Denver offense. 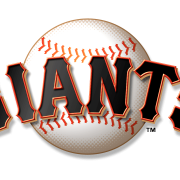 Manning threatened the San Francisco defense often, but the 49ers remained unfazed while keeping the veteran quarterback out of the end zone. Manning, who found his way into the 49ers red zone three times, was thwarted on every scoring chance by a pair of San Francisco’s young cornerbacks. CB Dontae Johnson looked sharp as he broke up a pass intended for Demaryius Thomas in the end zone to force a field goal. Kenneth Acker, whose impressive camp has earned him more playing time with the first team, also saved a potential touchdown pass after intercepting a Manning pass in the end zone for the turnover. Acker would also break up a third down pass from Manning to force the Broncos second field goal attempt of the game. It was another impressive night for the 49ers defense, who stood strong when backed down into a corner, limiting the future Hall-of-Fame Manning to 124-yards on 14-of-21 passing, picking him off once while disallowing him to find the end zone. 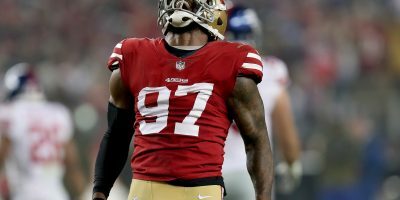 Minus Bowman’s impressive blitzing, it was evident the 49ers lacked a pass rush throughout the night upon the loss of OLB Ahmad Brooks. Corey Lemonier and Eli Harold received the starting nod, but failed to produce any sort of continuous pressure against the Broncos first-team offensive line. 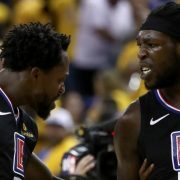 The defensive prowess for both teams continued into the second half of play, as the second-team offenses struggled to complete drives as well. QB Blaine Gabbert continued his impressive preseason run by leading the 49ers downfield for 23-yards to set up a 50-yard field goal for the powerful leg of rookie K Corey Acosta, who would split the uprights for the second score of the game for San Francisco. Gabbert would lead his team on yet another scoring drive during his following trip to the field, this time marching 36-yards downfield before setting up an easier 38-yard try for Acosta to give San Francisco their first lead of the game with a 9-8 advantage. The two teams would trade out field goals, and leads, one more time before the game saw its first touchdown. After 46 minutes of play, the Broncos were able to bowl their way across the goal line with a Juwan Thompson rush from the one-yard line for a 19-12 lead. The score was made possible after 49ers CB Mylan Hicks was called for pass interference on a deep ball by Broncos QB Brock Osweiler in the end zone. With two-minutes left to play, the 49ers inserted Dylan Thompson at quarterback for their final drive of the night, closing the books on Gabbert, who finished with an impressive 9-of-11 passing for 96 yards. 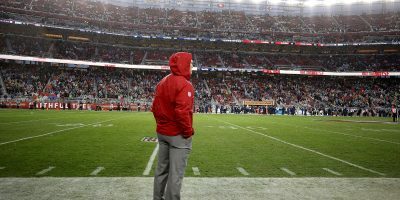 Thompson looked lost on the field, throwing three bad passes for no completions, forcing a three and out that would sink San Francisco’s chance at a comeback. Despite the ugly offensive showing, Saturday night’s contest offered us our first look at some players who factor to be important assets to the 49ers future season. Making his preseason debut alongside Bush and Hunter was WR Bruce Ellington, who looked solid in the return game, while also hauling in three passes for 29-yards. Blossoming folk hero Jarryd Hayne was stifled in the ground and return game, but flashed good hands while hauling in an 18-yard pickup from Gabbert in the third quarter. Saturday’s loss highlighted the 49ers inefficiency on offense, which begins and ends with the offensive line. 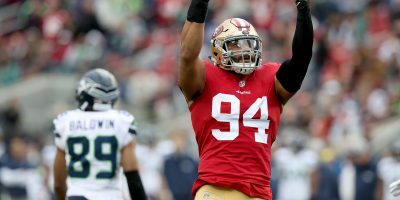 Despite all the exits from the organization, the losses of Mike Iupati and Anthony Davis are proving to be among the most crippling for San Francisco, as the first team offense has yet to amass a strong showing through three preseason games.